I have this coworker that lives on a real genuine farm. (In the Sacramento Area that’s not very common.) Throughout the year we are the very lucky recipients of various homegrown goodies. A couple weeks back he brought in the most gorgeous figs. I will admit, I look forward to his figs every year. Figs always inspire me to make fun and creative recipes. Well we were having some friends and their kids over the other day for a bbq and some slip n’ slide fun. I knew we would be sitting out on the patio and wanted to come up with a fun appetizer we would all enjoy with a nice bottle of white wine. This flatbread was amazing and so perfect! This took 15 minutes total and was super easy to whip up. 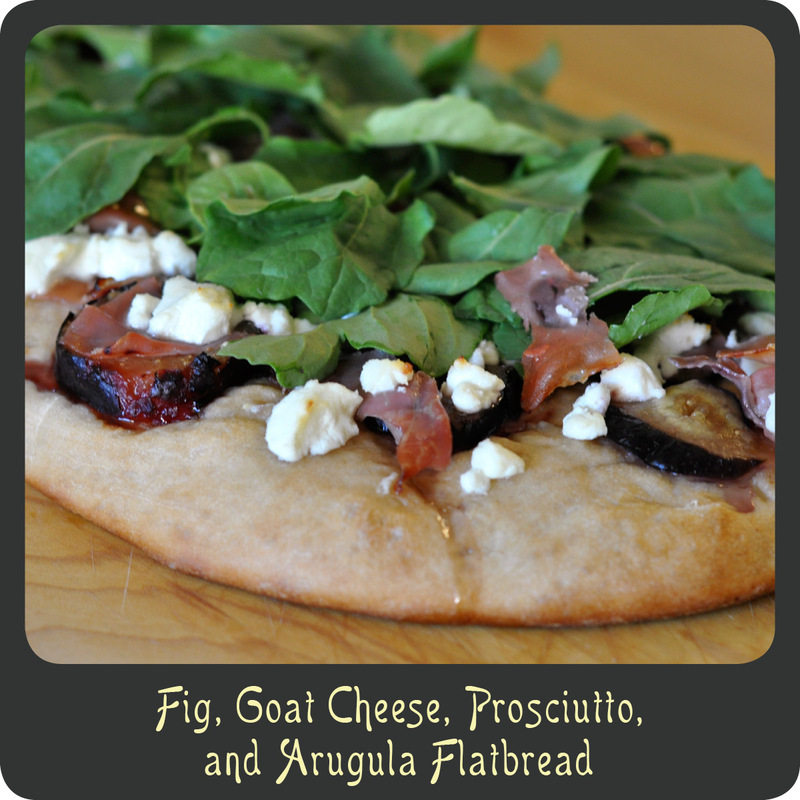 The figs are mildly sweet and go great with the richness of the goat cheese and saltiness of the prosciutto. The finishing touch of fresh arugula gives it a nice peppery flavor and the sweet honey just pulls it all together. This rustic flatbread is just layer after layer of fabulous flavors. Note: I used the Pillsbury whole grain pizza dough and thought it turned out great! Grease large nonstick cookie sheet with cooking spray. Unroll and press out the dough onto the prepared baking sheet to make a 10” x 15” rectangle. Drizzle the crust with olive oil. Place the fig slices on the crust in a single layer. Tear off pieces on the prosciutto and scatter it over the top of the figs. Crumble the goat cheese and sprinkle it over the flatbread. Season the flatbread with salt and pepper. Bake for 12–14 minutes or until the crust is a nice golden color. Drizzle the honey over the flatbread. Scatter the arugula over the flatbread. Slice the flatbread into squares and serve.